Macrae (MacRa or MacRath) is the name of a Ross-shire clan at one time very numerous on the shores of Kintail, but now widely scattered through Scotland and the colonies, more especially Canada. The oldest form of the name "M'Rath" signifies "son-of-good-luck". The clan is generally considered to be of pure Gaelic stock, although its earliest traditions point to an Irish origin. They are said to have come over with Colin Fitzgerald, the founder of the clan Mackenzie, of whose family they continued through their whole history the warm friends and adherents, so much so that they were jocularly called "Seaforth's shirt", and under his leadership they fought at the battle of Largs, in 1263. They settled first in the Aird of Lovat, but subsequently emigrated into Glenshiel, in the district of Kintail. At the battle of Auldearn, in May 1645, the Macraes fought under the "Caber-Fey", on the side of Montrose, where they lost a great number of men. The chief of the Macraes is Macrae of Inverinate, in Kintail, whose family since about the year 1520 held the honourable post of constables of Islandonan. A MS genealogical account of the clans, written by the Rev John Macrae, minister of Dingwall, who died in 1704, was formerly in possession of Lieut-Col Sir John Macrae of Ardintoul. and is now possesed by the present head of the Inverinate family, Colin Macrae, Esq W.S., who has also a copy of a treaty of friendship between the Campbells of Craignish and the Macraes of Kintail, dated 1702. This history contains many interesting stories, descriptive of the great size, strength and courage for which the clan was remarkable. One Duncan Mor, a man of immense strength, contributed largely to the defeat of the Macdonalds at the battle of Park, in 1464, and it was said of him that, though engaged in many conflicts and always victorious, he never came off without a wound; and another Duncan, who lived in the beginning of the 18th century, was possesed of so great strength that he is said to have carried for some distance a stone of huge size, and laid it down on the farm of Auchnangart, where it is still to be seen. He was the author of several poetical pieces, and was killed with many of his clan at Sheriffmuir, in 1715, his two brothers falling at his side. His sword, long preserved in the Tower of London, was shown as "the great Highlander's sword". Both males and females of the Macraes are said to have evinced a strong taste, not only for severe literary studies, but for the gentler arts of poetry and music. From the beginning of the 15th century, one of the Inverinate family always held the office of vicar of Kintail; and John, the first vicar, was much revered for his learning, which he acquired with the monks of Beauly. Farquhar Macrae, born 1580, who entered the church, is said to have been a great Latin scholar. It is told of this Farquhar, that on his first visit to the island of Lewes he had to baptize the whole population under forty years of age, no minister being resident on the island. BADGE: Garbhag an t-sl�ibhe (Lycopodium selago) club moss. As with so many others of the Scottish clans, traditions differ as to the actual origin of the Clan MacRae. The name MacRath, pronounced MacRa, or corruptly MacRae, the "son of good fortune," is said to have been the exclamation of a father regarding his son, who had performed some fortunate exploit. According to some, the clan was indigenous in the district of Kintail in Ross-shire, where the race is numerous to the present day. According to others, the ancestor of the MacRaes came over from Ireland in the thirteenth century with Cohn Fitzgerald, son of the Earl of Desmond, to whom the same tradition attributes the origin of Clan MacKenzie. MacRae, they say, fought under Fitzgerald at the battle of Largs in 1263, and while Fitzgerald was appointed Constable of Eilandonan Castle on Loch Duich, MacRae settled in the Aird of Lovat, from which his descendants afterwards migrated to Glenshiel in Kintail. This tradition hardly agrees with another, equally popular. According to the latter, Mary, daughter of the last chief of the Bissets, was fostered in the family of MacRae of Cluns. Marrying the ancestor of the Frasers, she carried the estates of Lovat into her husband�s family, and in token of the respect which she and her husband entertained for her foster-parents, a stone, it is said, was set up at the door of Lovat�s castle declaring that no MacRae should lodge without while a Fraser resided within. As the Bissets were forfeited in the reign of Alexander II., this story, if true, would show that MacRaes were substantial people in the north a considerable time before the reputed Colin Fitzgerald and his henchman fought at the battle of Largs. Whatever the actual origin of the Clan and name MacRae, however, it seems clear that, from their earliest appearance in history, a close and most friendly relationship existed between the MacRaes and the Chiefs of the MacKenzie clan. When the ancestor of the Earls of Ross was still only Colin og, son of Colin of the Aird, the MacRaes were probably his faithful adherents, and when Black Murdoch, son of Kenneth of Kintail, from whom all the MacKenzie chiefs were descended, received his charter from David II. in 1362, the MacRaes were no doubt part of his following. When the MacKenzie chief was arrested by James I., on his visit to Inverness in 1427, he is said to have been able to raise a force of 2,000 men. Of this host a considerable number must have been MacRaes, for it is said that, while MacKenzie owned Kintail, there were very few of his own name in the district, the majority being MacRaes. The latter were, in fact, known as MacKenzie�s Lein chrios, "mail shirt," or bodyguard. Their privileged and honoured place, nearest the Chief, continued even after his death, for at his funeral they took the first "lift " of his coffin as it left the castle on the way to burial. This last right was exercised even so late as the year 1862, when, after the death of the Hon. Mrs. Stewart-MacKenzie, daughter and representative of Lord Seaforth, her coffin was borne out of Brahan Castle by a contingent of MacRaes. As evidence of the high trust and esteem in which they were held by the Chiefs of Kintail, the MacRaes were again and again appointed Constables of MacKenzie�s stronghold of Eilandonan. The office was not hereditary or continuous, for MacKenzie appears to have been anxious to retain personal control of the castle. A list of the successive constables, which has been given as follows, will best show the position. Malcolm MacIan Charrich MacRae, circa 1509. John dubh Matheson of Fernaig, killed 1539. Duncan MacRae, "Donnachadh MacGillechriosd," temporary Constable 1539. John Murchison, "Ian MacMhurchaidb Dhuibh," Priest of Kintail, 1539. Murdoch Murchison, Vicar of Kintail, 1614. Farquhar MacRae, 1618-1651, Vicar of Kintail, son of Christopher MacRae, and born at Eilandonan in 1580, when his father was Constable. As followers of the MacKenzie Chiefs the MacRaes performed many famous feats of war. Some of the most notable of these were achieved during the struggle with the MacDonalds, which followed the resignation of the Earldom of Ross by the last Lord of the Isles in 1476. A sequel to that event was the feud between MacKenzie and Alexander MacDonald of Loch Alsh, nephew of the island lord. In an endeavour to recover the earldom and the lands transferred to MacKenzie by the King, MacDonald had invaded the country, burning and slaying. He was met and overthrown on the banks of the Conon by the son of the MacKenzie chief at the battle of Blar na Pairc. In this battle one of the MacRaes, Duncan More, a man of immense strength, is said to have played a very conspicuous part, and contributed largely to the defeat of the MacDonalds. It was said of this warrior that, though engaged in many conflicts, and invariably victorious, he never escaped without a wound. Another MacRae warrior, known as Surachan, after slaying a notable personage in the MacDonald ranks, was seen by MacKenzie to seat himself calmly on the body of his fallen foe. On MacKenzie asking why he had ceased fighting while so much depended on his efforts, Surachan replied, "I have done my day�s work. If every man does as much the day is ours! " "Kill more," exclaimed MacKenzie, "and I shall not count your work by the day! " Thereupon Surachan leaped to his feet, and dealt out a terrible slaughter upon the enemy. In consequence the battle was commemorated in the famous tune, "Spaidsearachd mhic Rha'," which to the present day, as its name imports, is the march of the clan. A few years later, in 1509, when Hector Roy MacKenzie was trying to wrest the chiefship from his nephew, John of Killin, whom he accused of illegitimacy, Eilandonan was held for Hector by its Constable, Malcolm MacIan Charrich MacRae. The besiegers brought MacRae�s cattle down to the shore and slaughtered them in his sight for food, but MacRae still refused to surrender, and held out till Hector made an arrangement with his nephew. Another episode of the feud with the MacDonalds which followed the transference of ancient MacDonald lands to the MacKenzies, took place in 1539. On this occasion Donald Gorm MacDonald of Sleat, learning that Eilandonan was slenderly garrisoned, laid siege to the island stronghold with fifty birlinns or galleys. John Dubh Matheson of Fernaig, the Constable of the Castle, had been killed, and only two men were left, Duncan MacGilchrist MacRae and the watchman. The defenders were nearly exhausted, and MacRae was reduced to his last arrow, when he saw Donald Gorm going round the walls to decide on the best place to make his final assault. Drawing his bow, MacRae sent out his last arrow. It struck MacDonald in the foot. In the pulling of it out an artery was severed, and the bleeding could not be stopped. The wounded man was carried some distance away, to a reef still known as "Larach tigh Mhic Dhomhnuill," and there died. His followers afterwards burned the castle and its boats, but this could not make up for the loss of their leader. Still another famous exploit was that performed by Duncan MacRae, grandson of Duncan MacGilchrist. In the chief�s absence in Mull, MacDonald of Glengarry had raided MacKenzie�s lands of Strath Carron, and was returning home with his galleys heavily loaded with plunder. Only a few men were left at Eilandonan, but Lady Kintail sent them out under the intrepid Duncan MacRae. It was a night in November, and the sea was calm, while there were occasional showers of snow, as MacRae waited under the shadow of the headland at Kylerhea. At last, on the rising tide a boat shot through the narrows. Recognising it as MacDonald�s scout, MacRae let it pass. A great galley next appeared, and, firing a cannon he had brought with him, MacRae dashed against it. Many of its oars were broken, and in a damaged state it ran upon the Cailleach Rock, where its entire crew of sixty, with MacDonald himself, were slain or drowned. In the Civil War of Charles I., when Montrose raised the Royalist standard in the north, the MacRaes took the field under Seaforth, the MacKenzie chief, and many of them fell in the campaign. By way of counterpoise to these losses they are said to have added to their numbers in a somewhat curious way. While the MacRaes were known as Seaforth�s "shirt of mail," the MacLennans, their neighbours in Kintail, were his standard-bearers. In this capacity, at the battle of Auldearn, a large number of the MacLennans were cut to pieces. As a result there were many MacLennan widows left in Kintail. No fewer than eighteen of these widows were married by MacRaes. The MacRaes, again, were out with Seaforth in the Earl of Mar�s rebellion in 1715. For that campaign Seaforth raised two regiments. Of these, two companies were raised in Kintail and one in Loch AIsh, and according to tradition were mostly comprised of MacRaes. It is said that, on the night before they marched away, they danced to the music of the pipes on the leaden roof of Eilandonan. Alas! in the battle of Sheriffmuir, on 13th November, at which the Jacobite cause collapsed for the time, many of them were slain. Among those who fell, along with two of his brothers, was a certain Duncan MacRae, who was notable both as a poet of no little merit and as a man of extraordinary physical strength. His claymore, known as "the great Highlander�s sword," was long preserved in the Tower of London, and on the farm of Auchnangart, in the MacRae country, is still to be seen a stone of immense size, which he is said to have carried a considerable distance and deposited where it now lies. In the subsequent Jacobite attempt of 1779, when Cardinal Alberoni sent a fleet of thirty ships with 6,000 troops and 12,000 stand of arms to Scotland, under the Duke of Ormond, and only two vessels with three hundred Spaniards reached these shores, the MacRaes were again concerned. But the affair collapsed after the skirmish at Strachells, known as the battle of Glenshiel, in which Seaforth was wounded, and on 10th May, three British men-of-war, the Worcester, Enterprise, and Flamborough, under Captain Boyle, sailed up Loch Alsh, stormed Eilandonan, and, after the surrender of the Spanish garrison, blew up the stronghold. To the same period belongs the story of one of the most famous members of the clan. James MacRae is said to have been the son of a humble washerwoman in the town of Ayr. Against his mother�s entreaties and advice he ran away to sea, and nothing was heard of him for forty years. Then he returned, a nabob of immense wealth, after having been Governor of Madras. Ascertaining that his mother had been cared for in her last days by a niece, he sought out the latter, and finding that the niece and her husband, one MacGuire, a country fiddler, had four attractive daughters, he undertook the education of these girls. When they became of marriageable age he saw them all well married and dowered them well. Lizzie MacGuire, the eldest, was married to the Earl of Glencairn, and received from MacRae as a marriage portion the estate of Ochiltree. To the second he gave the estate of Alva, and her husband, an eminent lawyer, became Lord Alva. A third, who married the son of Dalrymple, the minister of Ayr, received the estate of Orangefield, and the fourth married a natural son of his own, to whom he gave the lands of Houston in Renfrewshire. It is worth remembering that it was Lizzie MacGuire�s son, the Earl of Glencairn, who gave Robert Burns his chief lift when he went to Edinburgh to find his fortune, the poet having been recommended to his notice by his cousin, Dalrymple of Orangefield. So much had this member of the clan MacRae to do with the raising to name and fame of the great national bard. Governor MacRae also in 1734 presented to Glasgow its first statue, the equestrian monument to King William III., which still dominates the Trongate at Glasgow Cross. A monument was afterwards erected to the memory of MacRae himself in the parish of Prestwick, near Ayr. From an early date the MacRaes have been noted not only for exploits of arms, which brought them the title of the "wild MacRaes," but also for excellence in the gentler art of letters. From the early part of the fifteenth century some member of the race appears always to have held the office of Vicar of Kintail. John MacRae, the first vicar, is said to have studied with the monks of Beauly, and was much respected for his learning. The Rev. Farquhar MacRae, born in 1580, and last of the Constables of Eilandonan, was both an energetic churchman and a great Latin scholar. On his first visit to the island of Lewis he is said to have baptised all the inhabitants under forty years of age, no clergyman having resided on the island during that period. His second son, John MacRae, who became minister of Dingwall in 1640 and died in 1704, was author of a genealogical account of the clan, formerly in possession of Lieutenant-Colonel Sir John MacRae of Ardintoul, and now in the hands of Sir Colin MacRae, W.S., representative of the Inverinate family. Another of the clan, John MacRae, better known as MacUirtsi, was last of a race of bards who handed on a poetic tradition for several generations. A poem which he composed on a heavy loss of cattle which he suffered, is considered one of the classics of the Gaelic language. 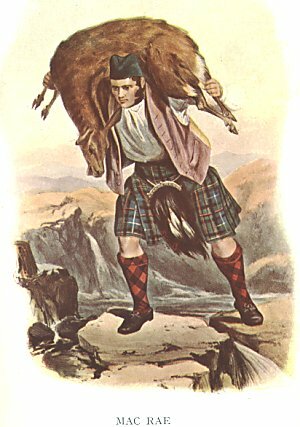 Disgusted with the modern decadence of Highland customs and the introduction of new-fangled "Improvements," he emigrated to America, and his lament for the necessity of doing so is also a notable composition. In our own time the late Rev. David MacRae was no less remarkable for his fighting qualities as an exponent of advanced opinions in theology, and for his upholding of the rights and honours of Scotland, than for his contributions to English literature. His Americans at Home and Amerzca Revisited furnish perhaps the best accounts of the manners and conditions of the great Republic of the West after the civil war between North and South. A few years ago the actual position of the clan with respect to its chiefship formed the subject of an interesting case in the Court of the Lord Lyon. Sir Colin MacRae, W.S., as representative of the family of MacRae of Inverinate, made application in that court for a grant of arms with supporters as the chief of the clan. His application was opposed by Major, now Lieutenant-Colonel, John MacRae-Gilstrap, whose elder brother, Mr. Stuart MacRae, is representative of the family of MacRae of Conchra. The contention of the objector was that the MacRaes had never acknowledged any other chief than Seaforth, and the upshot of the case was that the Lord Lyon refused the petition. The MacRaes of Conchra and the MacRaes of Inverinate both claim descent from the ancient Constables of Eilandonan. Recently Colonel MacRae-Gilstrap has acquired the island and castle of Eihandonan, and proposes to restore the ancient stronghold. Septs of Clan MacRae: Macara, MacCraw, Macra, Macrach, MacRaith, MacRath, Rae. The most famous Highland branch of the Macraes were to be found in Kintail in Wester Ross where they settled in the 14th century. Prior to that they appear to have inhabited the lands of Clunes on the Lordship of Lovat in the Beauly district. The founder of the Kintail branch is said to be Fionnla Dubh MacGillechriosd who died in 1416. His descendants from 1520 became the keepers of Eilean Donan, the stronghold of the Mackenzies of Kintail. Like the Maclennans, the Macraes faithfully supported the Mackenzies and were referred to as the "Mackenzies shirt of mail". Duncan, 5th of Kintail fatally wounded Duncan Gorm the chief of the Macdonalds of Sleat in 1539, protecting the castle. Some time later Duncan Macrae, Chamberlain of Eilean Donan was granted the estate of Inverinate that remained in the family for over 200 years. The Macraes as loyal followers of the Mackenzies were not only constables of Eilean Donan Castle but were also Chamberlains of Kintail and Vicars of Kintail as wel l as sharing with them their hatred of the Macleods. The Rev. Farquhar Macrae of Inverinate (1580-1662) combined his offices as Chamberlain with that of Vicar of Kintail for over forty years. His grandson, Duncan Macrae of Inverinate was the compiler of the famous Fernaig Manuscript 1688-93. However due to his marriage to one of the daughters of John Macleod of the island of Raasay, he was deprived of his inheritance. Although the Clan Macrae was not out in the '45, many of the Macraes took part in the rising and in fact their reputation as warriors continued over the generations and earned them the title "the wild Macraes". Other cadet branches include the Macraes of Conchra who descend from one of the sons of the Rev. Farquhar Macrae, and the Macraes of Clunes who stood in high favour with the Frasers of Lovat. In 1909, Sir Colin Macrae of Inverinate claimed the chiefship of the clan but the claim was opposed by a descendant of Conchra and hence there is no chief of the Clan Macrae today.